The upstate office finally expanded earlier this month! We have been steadily growing and the previous space was seeming smaller and smaller! This has been a dream/process long in the making! We are so excited to be able to expand to occupy the other side of our previous building! We have been able to spread out into new office spaces and we even have our own conference room! Our first staff meeting in the new space was so wonderful! 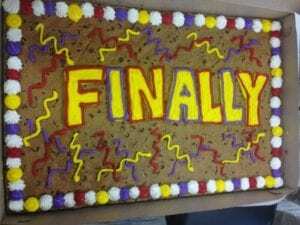 There was a celebration at the ‘grand opening’ and cake was served! Also new: a Coke machine, a craft room, small meeting room, offices for Case Management, and a space to keep archived records on site! We are still settling everything into place but there is a fresh and energizing spirit around the office these days! We love our new space!